Mum always made home made jam. When I make it I always remember a school primer that fascinated me with the story of a woman making jam, with rows of sterilised jars and the’ plip plop, plip plop ‘ sound of the jam as it went into the jars …. I love making jam and pickles, (I hate the washing up) I have made it in lots of kitchens, on lots of stoves over the years. I think my Edinburgh kitchen is my favourite place to make it. We have an extractor fan, and this morning it felt light and airy. I felt like a witch or wise woman measuring, stirring , tasting, throwing in ingredients, it was a friends birthday and she loves my pickle. I wrote this a while ago and remembered that I hadn’t posted it. It was part of me thinking about Home. Today I made strawberry jam which is my favourite. I like the idea of putting down roots. 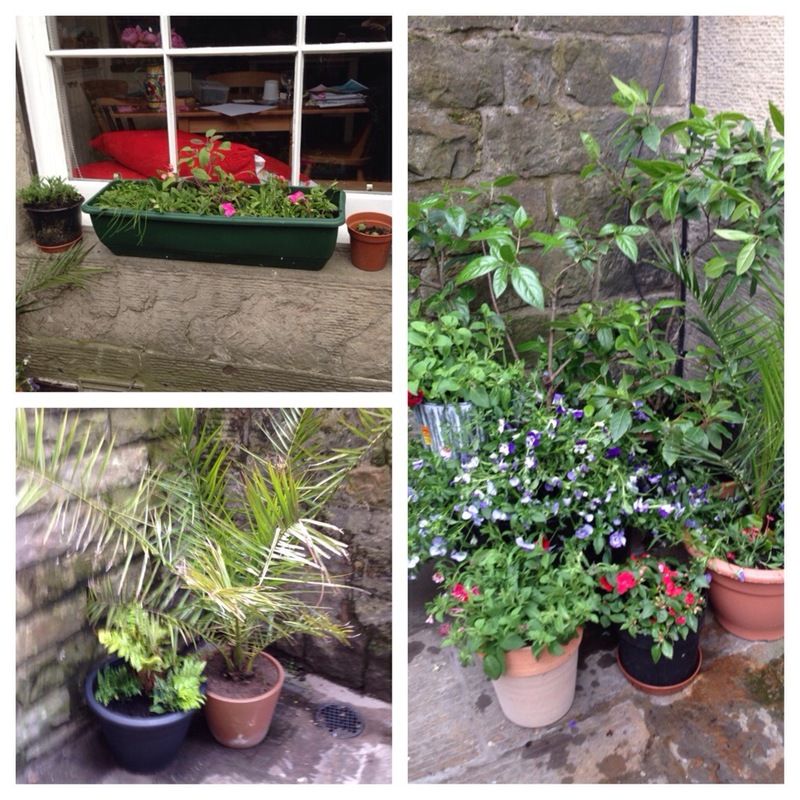 In Edinburgh, I was planting stuff in the patio area at the front of the house. l like being able to see green things instead of just wall, outside the window. I decided on ferns and palms, for reduced work load. I bought loads of stuff on discount and mixed and matched in tubs, window boxes and cracks in the walls. I needed to get things that were familiar. Out side the front door in Abingdon there has been a profusion of low lying purple bells with lime green leaves, I wanted to see if I could repeat the effect. I wanted lavender, rosemary, oregano, mint and chives, I don’t know if they will cope with the climate. I enjoyed the feel of the soil and breaking up the root balls was therapeutic. It wrecked my hands and I am still picking dirt out from under my nails 3 or 4 days later. I find myself worrying slightly that the fragile connections and relationships that I have made in the last year, could easily be damaged or broken, but the plant will be stronger for it . 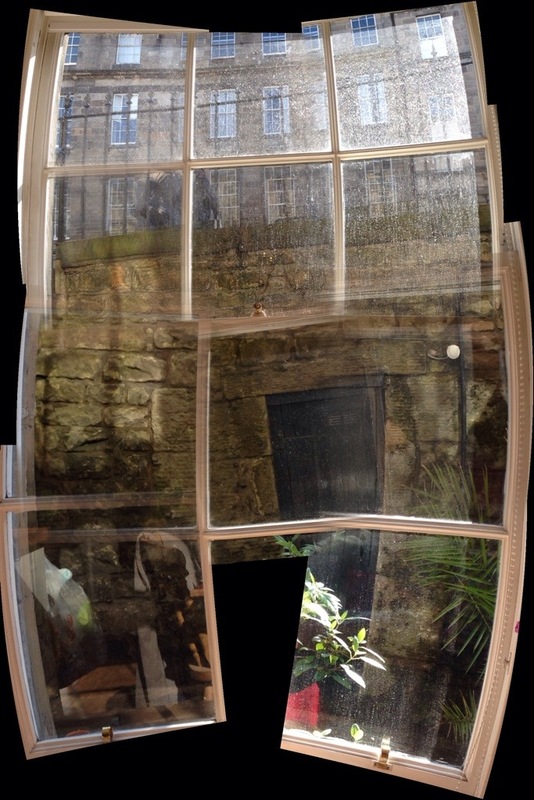 I moved to Edinburgh in July 2013. My art is influenced by pottery and architectural motifs that I have enjoyed during my stay here and travels back down to England. Some capture a sense of place or an individual’s character. I have always liked surface pattern and mandala shapes. 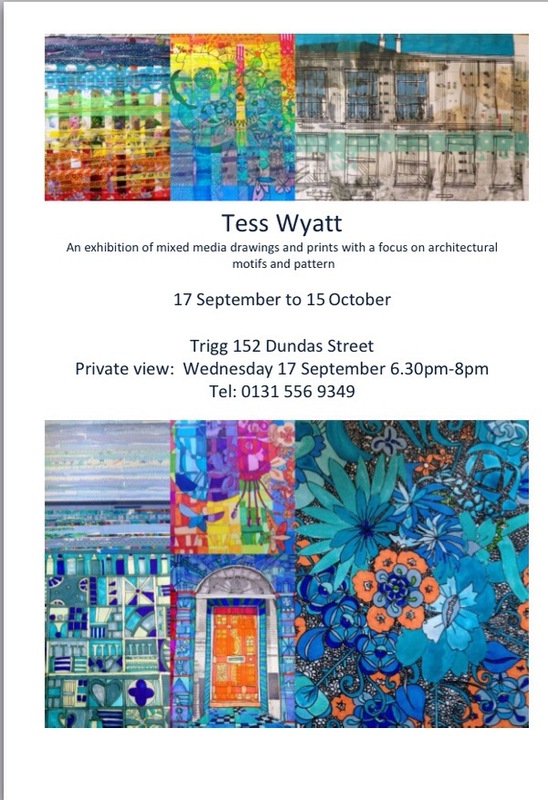 My work employs a sense of play with colour and line. Some are printed and layered using an inkjet printer, washi tape, acrylic and watercolour paint and various permanent pens They are all hand finished and protected with a UV varnish. 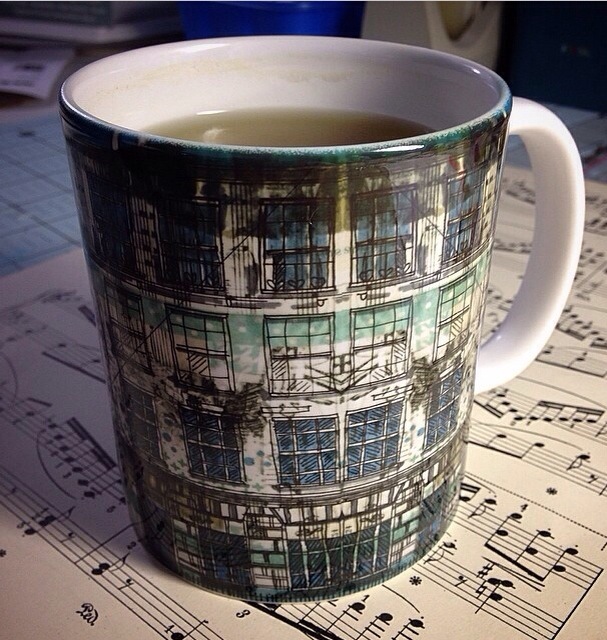 One of my friends in the US ordered a mug from Society6 – she has received hers already! I have been told that my delivery time is 3-5 weeks !